With nearly 600 miles of mainland coastline, it’s no surprise that Portugal has an abundance of beautiful beaches. Incredible sunsets, colorful cliffs, bright white sands, crystal-clear waters – with a little exploring, you’ll find them all somewhere along the coast. Here are five of the very best. Widely praised as one of the best beaches in Europe, Praia da Marinha makes regular appearances in TV advertising campaigns. 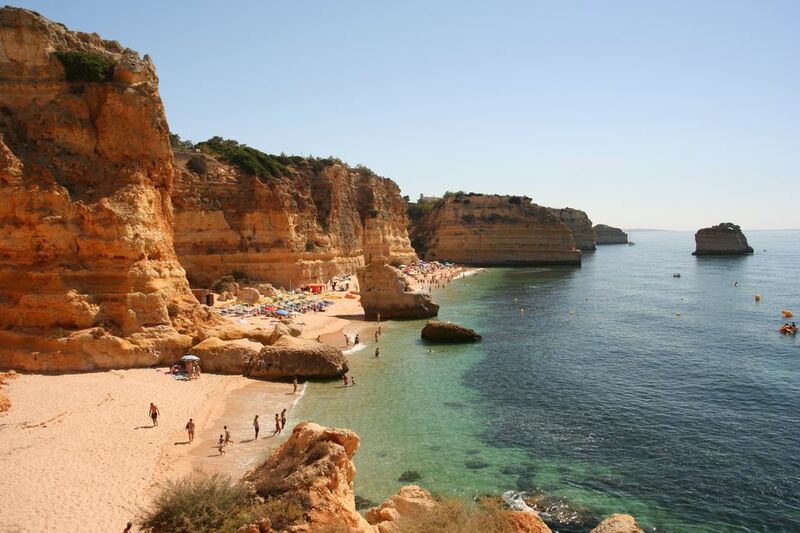 Renowned for its towering limestone cliffs and high water quality, the beach lies about twenty miles west of the popular resort town of Albufeira, in the Algarve region of the country. The beach’s inaccessibility by public transport is both a blessing and a curse — it makes it harder to reach, but because of that, there are typically fewer people than you’d expect in such a well-known spot. There’s car parking above Praia da Marinha, but the beach isn't suitable for the mobility-impaired, with a long, rocky staircase the only way to access it. Don’t just limit yourself to the shore, though. The clear waters and abundant marine life make this an ideal place to snorkel, and boat trips are also available to explore nearby caves and coves. Snacks and drinks are available at a beachside restaurant. Even closer to Albufeira lies Praia do Castelo, a small stretch of golden sand with history. Back in the 16th century, a fort overlooked this part of the coast, keeping watch for pirates raiding from North Africa. The name (castelo means castle) has stuck to this day, and the ruins can still be seen close to the access path that runs down to the beach. The tall cliffs provide plenty of shelter from the wind, but be careful about laying your towel out below them—they’re quite unstable, and it’s not unusual for rocks to tumble onto the beach. Maintaining a safe distance is a good idea! The water is crystal clear, making for an enjoyable, albeit refreshing, dip in the ocean. Praia do Castelo doesn't usually get too crowded, but if you'd like a little solitude, paddle around to the tiny coves accessible in both directions from the main beach. A small restaurant offers cold drinks and seafood to hungry beachgoers, and in summer, sun loungers and beach umbrellas are available for hire. There’s an irregular bus service that runs past Praia do Castelo, or taxis will charge around 7-8 euros to cover the four-mile distance westwards from Albufeira. A similar distance east of Albufeira lies the striking Praia da Falesia. The cliffs that line this stretch of sand are a wide range of colors, ranging from deep red to off-white, contrasting with the green pine trees that grow above them. As well as looking pretty in the backdrop of your selfies, those cliffs serve another useful purpose—they block much of the northerly wind that often blows in the low season. In contrast to some of the other beaches in the area, you’ll have no problem finding a bit of space to call your own, since Praia da Falesia is part of an unbroken stretch of sand that runs for nearly five miles. With three parking lots nearby, it’s rarely difficult to find somewhere to drop your car. Like Praia da Falesia above, there’s also an irregular public transport option via the number 8 bus (PDF), or taxis are available from Albufeira. If beautiful sunsets are your thing, head to Praia da Adraga. Easily visited as a day trip from Lisbon (it’s about 25 miles from the capital, in the Sintra-Cascais Natural Park), the mixture of golden sand, orange sky, and jagged rocks silhouetted just offshore, make for an unforgettable view. Once you’ve taken all your sunset photos, head to the Restaurante D'Adraga, right on the beach, for seafood-heavy meals including clams, lobster and octopus, all washed down with a glass or two of local wine. The 403 bus from Cascais or Sintra is the closest public transport to Praia da Adraga, but even then you've got a 20-30 minute walk to the beach from the nearest stop in Almoçageme. The most convenient way to get there, then, is a rental car, or taxi/Uber from Cascais or Sintra. It’s best to visit during the week if you can, as parking spaces are limited and the beach can get quite crowded on summer weekends. A little further down the coast, Praia do Guincho might look surprisingly familiar if you’re a fan of old Bond movies. The opening scene of 1969’s On Her Majesty’s Secret Service featured the British spy, this beautiful beach, and unsurprisingly perhaps, an equally-beautiful woman in distress. While you may not find many MI6 agents on Praia do Guincho these days, there are other reasons to pay it a visit. The regular offshore winds make it a mecca for surfers and kitesurfers, and you can take lessons or rent equipment right on the beach. Swimming, though, can be dangerous due to strong currents. When the surfing’s done and you’ve spent enough time in the sun, treat yourself to a meal at Fortaleza do Guincho, the Michelin-starred seafood restaurant that sits on a cliff above the beach. Reserve well in advance, though—tables are hard to come by.